I’m sharing #Curél in my life as part of a sponsored series for Socialstars™ All opinions and thoughts are always honest and my own. While it seems odd to apply moisture to the skin when it’s wet, it becomes easier and more common over time. The best reason to use a moisturizer as you’re getting out of the shower is because your pores are wide open, and able to soak in more moisture. 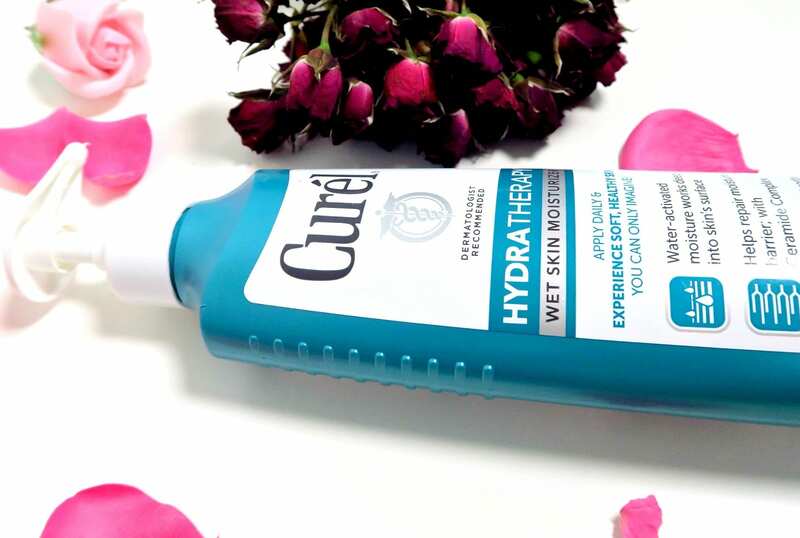 This Curél® Hydra Therapy Wet Skin Moisturizer gets deep into the pores and hydrates your skin, solving many of our day to day problems. This helps to make the skin smoother over time, and able to retain more moisture. The biggest difference in my skin is the reduction of red bumps on my thighs, which many would refer to as ingrown hairs. After using this moisturizer on that area for a month, it appears the moisture has helped get rid of those suckers. In addition to moisture and the reduction in my red bumps, I have noticed that my skin is much smoother. Areas that used to be problematic (thinks elbows and knees) are now completely moisturized. I’ve always struggled with dry elbows, and I no longer have to worry about it. One of the main ingredients in this moisturizer is ceramides, which are natural building blocks for healthy moisturized skin. When your body is susceptible to dry skin (like those of us living us in the dry dry desert) the skin has a harder time getting the right amount of ceramides which makes the skin harder to moisture. Have you had the feeling when you’re moisturizing, but it just doesn't seem to helping? At all? Or your skin soaks it right in and it's like you never moisturized? This could be due to the lack of ceramides. One specific point I’d like to bring up is that Curél® Hydra Therapy Wet Skin Moisturizer received the National Eczema Association Seal of Acceptance™ which means it can help with eczema. This is something that runs in my family, and I get very dry and irritated skin when I use different types of water throughout the world. It’s an odd observation, but when I travel outside of the US, the water can really irritate my skin. Sometimes it is just another state, but this is definitely something to keep in mind too since the moisturizing power is good even in a tough skin condition like eczema. If you’ve been around my little corner of the internet for a while, you know that I am very sensitive to smells. If products have very fragrant scents, it starts to mix together and it gets obnoxious quick so I always prefer not to have anything too fragrant on my skin. This is the perfect non-fragranced moisturizer that doesn’t mix with my perfume or hand cream. It is completely greaseless which is so nice, and means you don’t have to try to figure out how quickly you can wipe your hands off so you don’t feel grease under your fingernails. One thing I will advise you with is that when you start applying this to wet skin, don’t panic if the moisturizer doesn’t soak into the skin immediately. While it may appear it is not sinking in, the product is being absorbed quickly so apply an even layer on your legs and the rest of your body, and it will soak into your skin in 2 minutes. It works quick! Have you tried a wet skin moisturizer in the past?